I'm not a clean freak (you would know this if you had ever met me!) but since the Kärcher Steam Cleaner came into my life, I've certainly found a lot more enjoyment in my weekly cleaning flourish! I was asked by Kärcher to review one of their Steam Cleaners from a parent's point of view. There is something very satisfying about blasting dirt away. Especially when it is dirt that has been sitting there teasing and taunting you for many years. Having blasted my way through the kitchen with the steam cleaner one rainy Sunday afternoon, my kitchen was almost unrecognisable. You know the really gunky bit by the side of the dishwasher where all the dribbles of tea and food collect?.. totally spotless. You know the gungy bit at the back of the cooker and the oily bits on the outside of the cooker hood?.. totally spotless. If you've ever owned a cat... you know the bit of plastic around the outside of the catflap that collects general purpose yuck combined with a layer of cat hair that normally won't budge?.. totally spotless. With a gadget such as this, I could actually get to enjoy cleaning!!! 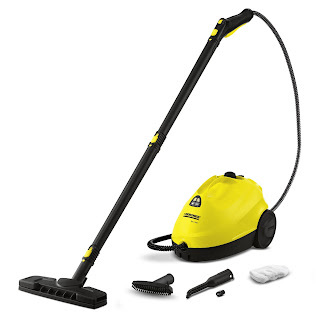 For me, there are two big attractions to the steam cleaner beyond it's ability to shift hard-to-clean dirt. The first is that it doesn't require me to use chemicals which makes me feel better about my impact on the world; the steam cleaner simply uses a jet of steam which you can focus using different sizes of brush head. The second big attraction is that a steam cleaner can help to remove known allergens such as dust mites and pollen and you can use the steam cleaner to freshen up fabrics and use the power of the steam to get rid of nasties from materials you probably wouldn't be able to put through the washing machine - the curtains, sofa covers and the girls' mattresses. The two places where I have found the Kärcher steam cleaner to be most effective are on removing stains such as limescale and toothpaste from the bathroom sinks and.... and this is the best... Holly's highchair. Our highchair has lasted three years now but I normally find it astonishingly hard to clean. On every single joint there was three years worth of baby food that I hadn't even been able to flush out with an old toothbrush. Every couple of weeks I remove all the padding and covers from the highchair and try to remove the dried-on food but I had never quite managed to get it clean until I started using the steam cleaner. The steam cleaner makes light work of it - blast, blast, blast and within about 2 minutes it looks as good as new. Who would have thought that a steam cleaner would become my number 1 weaning aid? I also find that with one of the soft terry cloth covers over the floor-cleaning head, that I can clean up the floor beneath the highchair in a matter of seconds as well. The highchair AFTER - much more hygienic! The entry level Kärcher SC 1.020 Steam Cleaner costs around £129.99 and the SC 2.500 C costs around £219.99 and I think I've already got more value from it than many of the other cleaning gadgets I've ever owned.